Name the husband-and-wife comedy team who co-starred on film, radio, and TV, headlined Broadway and Vegas, guest hosted The Tonight Show, co-wrote a best-selling memoir, and performed together for more than 40 years. Here’s a hint: it isn’t George and Gracie, Jack Benny and Mary Livingstone, or Lucy and Desi. Give up? The answer is Peter Lind Hayes and Mary Healy. If you just said “Who?” you’re not alone. But while the duo may be largely unknown by younger audiences today, they were one of the biggest specialty acts of the Eisenhower Era. And now, thanks to getTV, you have a second chance to see what you missed 57 years ago. Peter Loves Mary, the 1960 sitcom starring Hayes and Healy, is now on getTV weekday mornings at 6:40 am ET/3:40 am PT. And if you’re not in front of your television at that early/late hour, this never-on-DVD rarity demands a season pass on every classic TV lover’s DVR. Developed by film producer Walter Mirisch and Your Show of Shows writer Danny Simon (Neil’s brother), Peter Loves Mary is a semi-autobiographical comedy about a celebrity couple who relocates from Manhattan to the ‘burbs to raise their kids (a move the Hayes-Healy’s made in real life). Peter Lindsey (Hayes) is a corny comic who’s not quite ready to trade nightclubs for 4-H Club. Mary Lindsey (Healy) is a singer who yearns for the pastoral life she sees in magazines. But, as the title suggests, they love each other. So they compromise. Peter and Mary are assisted in pursuit of domestic bliss by Wilma (Bea Benaderet), a wise-cracking housekeeper – Is there any other kind on TV? – who sounds a lot like Betty Rubble. (Yes, Benaderet played Betty on The Flintstones and Wilma on Peter Loves Mary in the same season. Impress your friends with that trivia.) Wilma also helps takes care of the kids: six-year-old Stevie (Gil Smith) and eight-year-old Leslie (Merry Martin), who inexplicably ages to 11 later in the season but is not recast (just given a new haircut). Also featured are Mary’s blustery businessman dad (Howard Smith), her mom (Harriet E. MacGibbon), and family friends Claire (Joan Tompkins) and Bill (David Lewis, later Edward Quartermaine on General Hospital). Part of the fun of Peter Loves Mary is the parade of familiar faces who pop up in every episode. Peter and Mary’s agent is played by Alan Reed, Fred Flintstone himself. 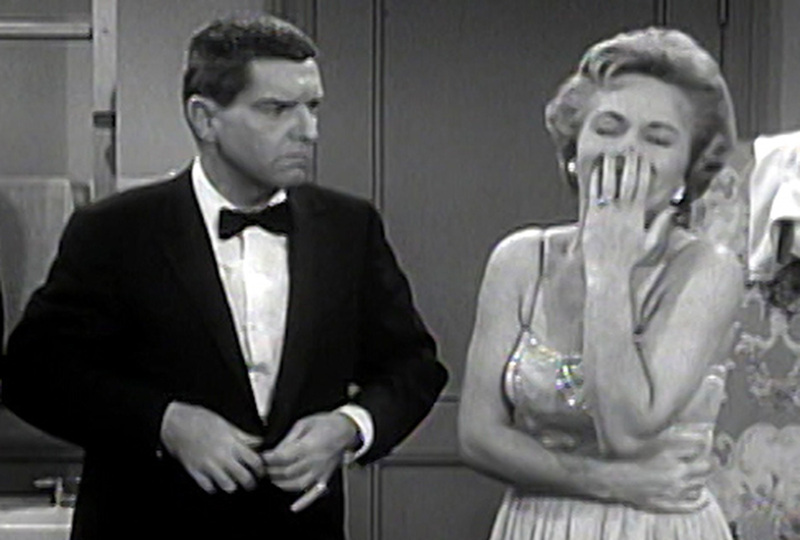 Betty Garde recurs as ill-tempered maid Gladys, a character similar to one she portrayed on The Honeymooners. Six years before she put on the Batgirl cowl, Yvonne Craig plays a high school student who goes batty for Peter. And the list goes on: Wallace Ford as Wilma’s crazy uncle; Stuart Erwin as the town judge; Jack Weston as Peter’s prevarication-prone ghostwriter; John McGiver as the head of the commuter railroad; David White as a Larry Tate-esque executive; and countless more. But a show called Peter Loves Mary lives and dies on, well, Peter and Mary. And both stars are thoroughly charming. The series often feels like a gender-swapped I Love Lucy, with the woman as the confident star and the man as the vain, paranoid, spotlight-craving spouse. Peter is worried about aging, so Mary reassures him. Peter wants to write a book, and Mary encourages him. Peter gets duped into buying stock in a failing club, and Mary agrees to perform with him to draw audiences. In Hayes’ Peter you can see elements of Chester A. Riley and Ralph Kramden by way of Jack Benny. It’s a hilarious performance, and a credit to a seasoned comic actor like Hayes that he could so effectively play someone less good at his craft. So why are Peter Lind Hayes (who died in 1998 at age 82) and Mary Healy (2015, age 96) not better known today? In part, because so much of their work was ephemeral. Their week-long guest hosting stint on The Tonight Show in 1962 is lost to time, as are entire seasons of talk and variety shows they co-hosted throughout the ‘50s. A 1959 NBC adaptation of Miracle on 34th Street in which they co-star as Fred Gaily and Doris Walker exists only in kinescope (as do a handful of game show appearances). That leaves their co-starring turn in The 5,000 Fingers of Dr. T, the delightful 1953 Technicolor musical fantasy written by Dr. Seuss, as really the only way for contemporary audiences to discover this delightful duo. Until now. If you love classic TV comedy, it’s time to meet Peter Lind Hayes and Mary Healy: the best married comedy team you’ve never heard of. Peter Loves Mary airs mornings at 6:40 am ET/3:40 am. To see even more air dates and times, visit the getTV schedule.